Well, this week’s weekly photo challenge sure is timely. “Vivid”is the word. It is timely because this little guy is graduating from high school today. But what is vivid in my mind? This image of him starting kindergarten literally feels like it was taken yesterday. I can remember the missing tooth, the USA baseball shirt, the backpack and the flowers blooming on the front porch. Yesterday. Time goes so fast when you’re looking back. But at this stage for him….when he was five? Time often doesn’t move quite fast enough when we’re looking forward, especially for a five year old. This little guy is our fifth child, so he waited a long while until it was his turn to go to school. He had watched his older siblings go off to school with their new shoes and backpacks and school supplies, and wonder when it was going to be his turn. And one day, his turn came and he was just so excited to finally step into this new venture of going to school. 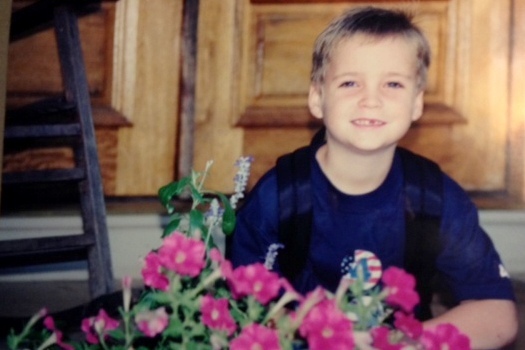 This precious photo was taken that very day…his first day of kindergarten. Yes, it’s definitely a vivid memory that evokes so much emotion in me…joy and and sadness all wrapped up in one. Today, as we celebrate this child, rather, this young man and his graduation from high school, we’ll be both looking back and looking forward. We’ll be looking back on the 18 previous years and remember and smile. We’ll also be looking ahead to what’s ahead as he goes to study at college. Wouldn’t it be nice in the looking back and the looking ahead the same time if the time would just stand still for a little while? No, we all know better that the time won’t stand still. But, in the same way that I have an extremely vivid memory of his first day of Kindergarten, I think I’ll have an incredibly vivid memory of him graduating today. In fact, I know I will. And I’ll be sure to take a photo of the once little boy with the toothless grin who is now more of a man than a boy, but still has a grin to melt the heart of this mom. Yes, these are definitely vivid, vivid times. I”m so thankful for monumental moments to just sit and savor the beauty of the people in our lives…while they are still right there with us. For one thing is for sure. Little boys and girls have a way of growing up and moving on awfully fast for sure.